They have backed many of the world’s most successful companies. But what do prominent venture capitalists like Marc Andreesen, Mary Meeker and Josh Kopelmann do when they’re not unearthing the next Facebook, Uber or Whatsapp? For one thing, they read. And quite a lot, as the Visual Capitalist reports. 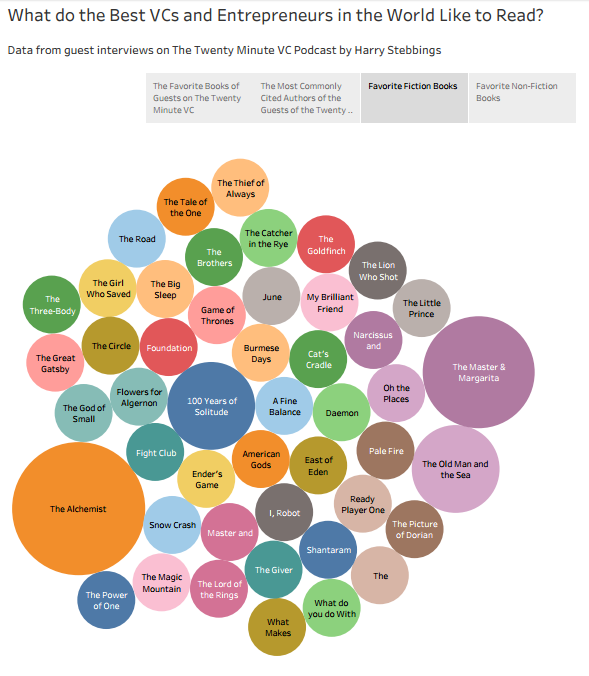 This is based on recent analysis by blogger Joe Hovde of the popular 20 Minute VC podcast , which features interviews with leading venture capitalists (VCs), which cover which authors they favour the most. Not surprisingly, the three most admired books to get a mention were written by fellow entrepreneurs and investors. By a large margin, the most cited book was Ben Horowitz’s The Hard Thing About Hard Things . Horowitz runs Silicon Valley venture capitalist group Andreesen Horowitz, and has famously backed the likes of Airbnb, Twitter and Facebook. As a former entrepreneur, he recounts the trials, tribulations and lessons learned from building a start-up during the "dotcom bust". Peter Thiel’s Zero to One comes in second place. The book focuses on how future start-ups can find the "white space" to create innovative products in an increasingly saturated world. Thiel is another legendary Silicon Valley investor, though better known as the co-founder of PayPal. Third in line is The Lean Start-Up . Here, Eric Ries develops a management methodology for start-ups based on the Japanese concept of "lean manufacturing", applying its principles of waste-reduction to modern web-based businesses. The list also features business evergreens such as Dale Carnegie’s How to Win Friends and Influence People and Good to Great by Jim Collins, alongside more theoretical works such as Nassim Taleb’s Antifragile and Fooled by Randomness , which focus on making the most of chance. When it comes to fiction, Paulo Coelho’s bestseller The Alchemist tops the list. The novel’s central message, that all the universe can conspire to help you reach your goals, might well resonate among venture capitalists, many of whom started out as entrepreneurs. The Master and Margarita , Mikhail Bulgakov's satirical novel about a visit by the devil to Stalinist Russia, comes second. Close behind are Gabriel García Márquez’s 100 Years of Solitude and Ernest Hemingway’s The Old Man and the Sea . It is easy to see why Hemingway’s themes of courage in the face of defeat and turning a loss into success would strike a chord with investors, who may have had a few similar experiences of their own.